At this complimentary visit, we can complete the necessary paperwork, answer questions, transfer keys and tour your home while discussing detailed instructions on how to care for your pets. Give your dogs the exercise they need! This visit includes water and food replenish and lots of love and attention! It's a Day in the Park! This trip includes transportation to and from with lots of playtime and fun at the dog park or beach. 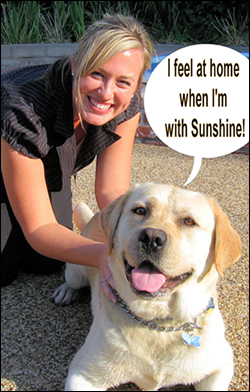 We can take your pet wherever he or she needs to go. Can't get to the pet store or groomer? We'll be happy to bring you whatever supplies you need to your home or take poochie to the groomer. Mail and newspaper retrieval, plant watering, garbage set-out, window blind, TV radio and light rotation will be done free of charge while you are away. An additional $10 fee will apply for each service on all major holidays. Overnight pet sitting is available. Please contact us for more information. We are open to expanding our service area on a case by case basis, so give us a call! PAYMENT - Cash checks and credit cards are accepted. All service paid up front in full. Returned Checks - If your check does not clear for any reason, your fee will be $35.00. Cancellations - Fees will be charged if service is cancelled less then 24 hours prior to a scheduled vistit. The fee for pet care visits & dog walking is $20.00. Early Returns - No refunds will be given for early returns once the time has been reserved. Visits cancelled within 24 hours notice, may receive credit against future service. Last Minute Reservations - A charge of $35 will be applied for a late booking. Pay for your Pet Sitting Services now - Please apply a 3% credit card charge fee at check-out. receive $20 credit towards your next visit!